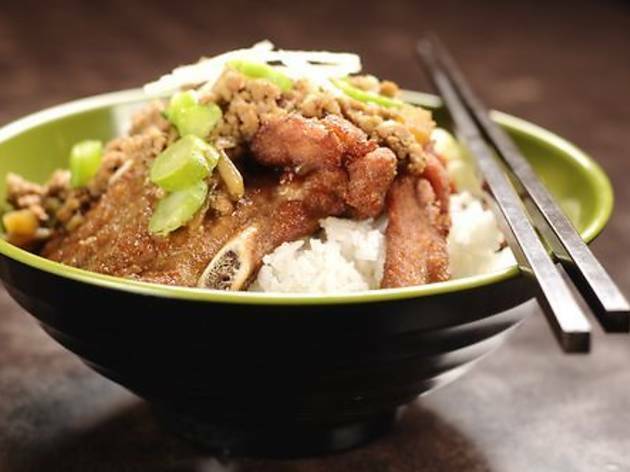 In North Point, it’s easy to do a noodle shop crawl and not hit the same dish twice. Almost every region of China, or the Chinese Diaspora, can be found in this part of town in noodle form. So then why is it that this particular noodle bar always seems to have a line outside? The only formalities you need to know about at A One Noodle Shop are these: bring your own tissues, be prepared to share tables, and be well-versed in your Chinese soap operas as they play nonstop on the television. Other than that, be advised that there are no English menus. What you might need to do is look around other tables for ideas and be slightly adventurous. There is usually a helpful waitress on duty who is fluent in English and who can offer assistance if needed. 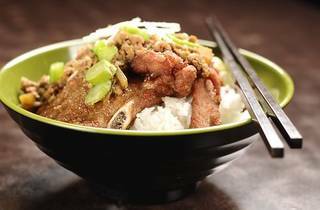 If you’re a pork fan, there’s one dish that you can’t ignore: the large bowl of fried thin-cut pork chop, braised in minced pork gravy and ladled over pork fat rice might well be the best item on the menu. As part of the set meal ($32), this comes with a side dish of boiled cabbage, and it arrives with a single spoon planted in the rice. This is your shovel. Bits of savoury preserved vegetables, and we think, a touch of chillies (though we couldn’t actually see any) suggest there is more than just pork fat causing this taste sensation in your mouth. A generous helping of MSG also helped this dish along. But what lured us here in the first place was their pork chop noodle soup. There are countless combinations available of this hearty bowl of noodles, but we went for the classic: fried pork chop with sweet and sour vegetables over hand-cut flour noodles ($28). Thick and uneven, the noodles would’ve been better holding a coat of sauce with not so much soup; nonetheless, it was good slurping. A dollop of spicy preserved winter cabbage with roasted peanuts added another dimension and contrast to the freshly chopped squash. The soup base was good-to-great, while the pork chop was great-to-spectacular. The turnover is fast – our table flipped twice in the space of 20 minutes – and patrons eagerly grab a spot as soon as anyone got up. We haven’t seen this kind of action since Crystal Jade first turned up in Taikoo Shing. You might leave with a mouthful of MSG, but it’s really kinda worth it. G/F, 3 Tsat Tsz Mui Rd, North Point, 28840 1070. Open Daily from 7am -11pm. Meal for two: around $70.